Jamba! “Mobile” was produced in early 2006 for Jamba! represented by Michael Kocurek at Infosection e.K. Jamba! “Mobile” features “Swead”, the curious little red monster who many of you may remember from several years ago. Since then, “Swead” has gone on to win numerous awards while gaining international recognition. It was partially due to his popularity that a commercial was soon after produced to advertise Infosection’s upcoming “Das Turnier” game and Jamba’s mobile ringtone services. Jamba! “Mobile” was one of the most technically challenging projects to execute due to the extensive and thorough use of special effects featured throughout the commercial. Not only did we have to deal with fur dynamics, but also fire, smoke, rigid-body simulations, and much more. The project was so technically complicated that each and every time a technical issue was resolved, three new ones would arise. As a result, and in an attempt to not become overwhelmed with the situation, we tackled each problem as it came, one at a time, and eventually we reached a point in which we were able to begin rendering final scenes. Style, both in animation and design, played a critical role in this spot. I wanted the animation style to be very cartoony and this therefore required a significant amount of squash and stretch which is generally quite difficult to achieve with 3D meshes. As a result, unique rigging and mesh deformation techniques were used which would allow us to pose the character in any way we wanted, as well as deform it in any number of ways. Stretchy arms and legs were set up so that exaggerated keyframes could be produced. Visually, the rendering style also had to be very cartoony. This is actually more difficult to achieve than photorealism in some cases, especially when dealing with plugins that have been specifically developed to produce photorealistic results. Afterburn, for instance, the smoke generation plugin, produces highly realistic smoke effects. However, I wanted the smoke to fit the cartoon visual style and this required a ‘clumpy’, unique rendered look. The density had to be just right as well and to accommodate these specific demands certain tweaks were applied to the rendering engine which we would have never considered using otherwise. The fur simulation was always the last of the operations to be performed prior to the render and it was not uncommon for a file size to bloom from 14 MB to over 400 MB as a result of the massive dynamics data. This, in turn, presented RAM issues which would therefore only permit scenes to be rendered on workstations with at least 2 GB of RAM. The render times were surprisingly efficient considering this was rendered with full global illumination features lighting literally tens of thousands of geometric hair strands, each of which was dynamically simulated. 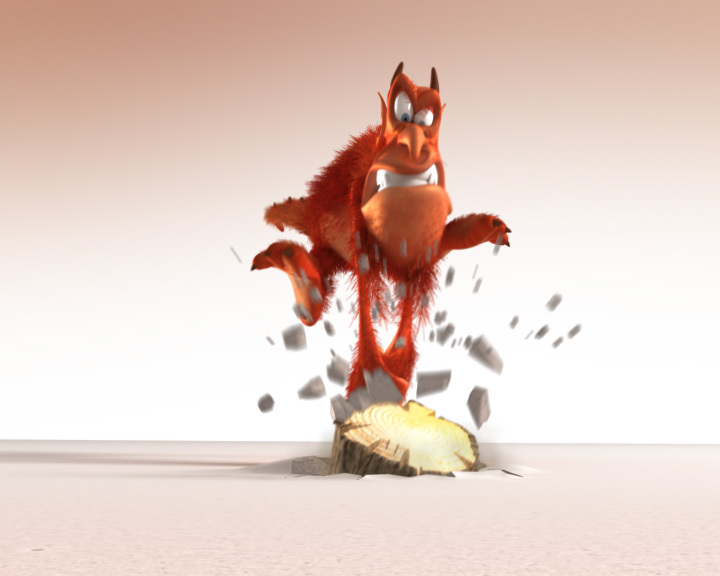 Render times for the character pass were on average 30-45 minutes, with production settings including 3D motion blur. The project schedule was about two months from pre-production to final delivery. This project was created with 3dsmax 6.0, rendered with VRay 1.47.03 and composited with Combustion. 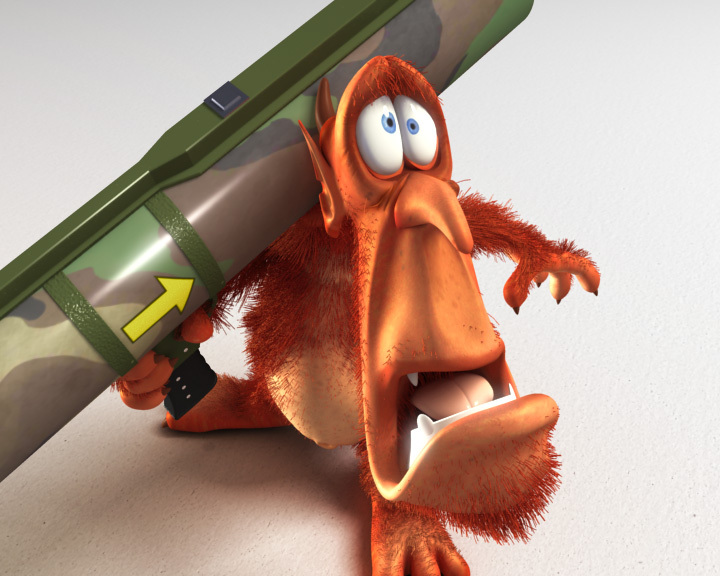 The fur was created with HairFX, the particle systems and rigid-body dynamics with Particle Flow, and the smoke and fire with Afterburn.